Maybe you’re a seasoned musician or just getting started, so you’re looking for the best electronic drum sets with the goal of finding the right model. Our experts researched and reviewed a wide range of drum kits, so we could bring you a top ten list featuring something for everyone. If you’re in the market for a killer drum set that delivers traditional sound with all the amenities of the modern world, you’ve come to the right place. Drum Pads: Not everyone who plays the drums has the luxury of privacy! Luckily, you don’t have to compromise quality to find a quiet set. We’ll tell you how many pads come on each model. 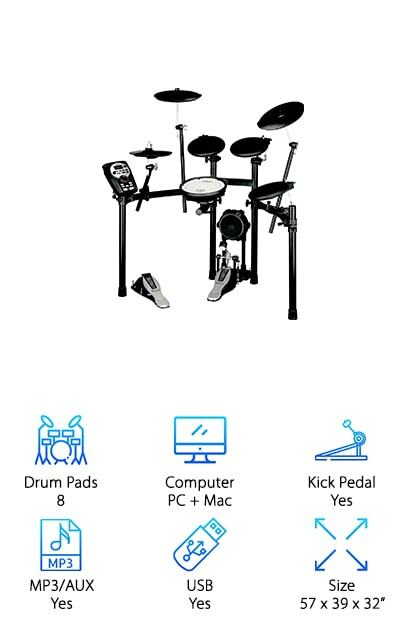 Computer: Before you purchase your dream drum set, be sure it’s compatible with your electronic devices. This spec lets you know if the kit you’re interested in hooks up to Mac, PC, or both, so you can be sure you reap the benefits of recording your tracks. Kick Pedal: When you’re looking for a realistic sound and feel, you’ll want to know that the set you’re eyeing includes a kick pedal or foot pedals. We’ve determined whether or not each model has this feature with a yes or no here. MP3 AUX: Modern technology has many benefits, one of which is the ability to plug your drum set in and play along with your favorite CD or MP3 tracks. Check this spec to determine if the set you like comes with an Aux input. USB Cable: Having the option to record yourself jamming is an unbeatable feature that helps you hone your skills. Check this spec to determine if the professional electronic drum set you like has a USB port. Size: You need the most convenient drum set for your living situation. Whether you have a whole room set aside for acoustics or you need a smaller model that fits into an existing environment, we have the dimensions for each set outlined in this spec. Now that you know what to look for when shopping, you might be asking yourself what is the best electronic drum set? It depends on your specific needs! Our experts completed several electronic drum set reviews to bring you the best we could find on the market today. We’re confident you’ll find exactly what you’re looking for on our list. Let’s get shopping! Play like a pro with our top pick, the Alesis Nitro. The options are endless with this deluxe model. 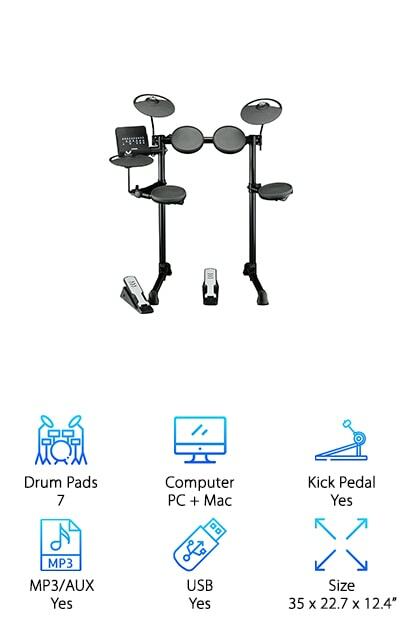 An eight-piece kit that rests on a four-post aluminum rack for a solid playing experience, it’s easy to see why any Alesis electronic drum set review has fans raving. It features 40 ready-to-play kits, 60 built-in play-along tracks, and 385 custom sounds, so you can create your own kit. Equipped with an eight inch snare, eight inch toms, and 10-inch cymbals with three ultra-quiet pads, you can rock out in style or practice quietly. The ride, hi-hat, and crash with choke cymbals let you easily express your individual playing preferences and experiment with a variety of sounds. The kick pad tower and bass drum round the set out for a complete design, capable of natural, professional acoustics. Enjoy the added technology of a sequencer, metronome, and performance recorder. Even better, this awesome set hooks right up to your Mac or PC, so you can record and edit your tracks from any computer. 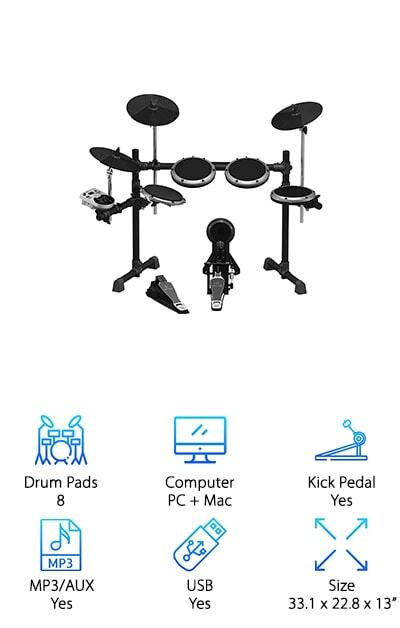 Don’t miss out on this top rated electronic drum set. 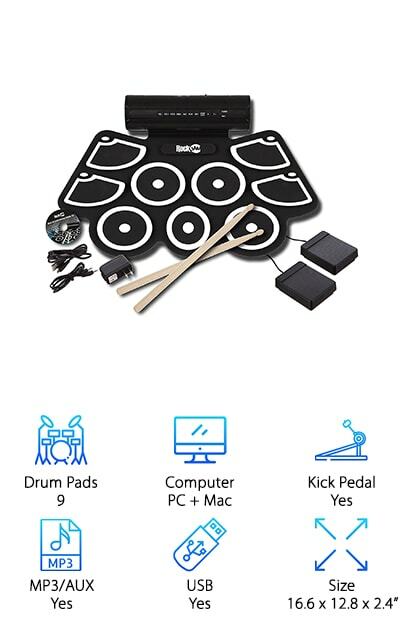 When you’re looking for the best cheap electronic drum set, look no further than this ultra-portable, convenient roll-out drum kit, which sets up easily on any tabletop surface. 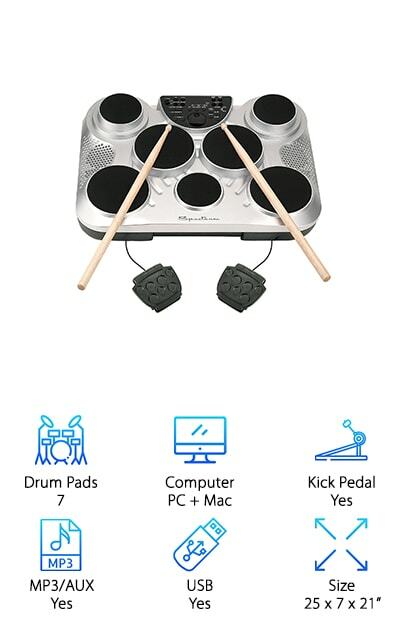 Nine separate drum pads create realistic sound, so you can make beats similar to a non-electronic drum kit. The pads are designed to mimic a crash cymbal, high tom, snare, open and closed hi-hat, low floor tom, low mid-to, and ride cymbal. The RockJam also comes with two foot pedals that give this small, but sturdy pad the sound and vibe of a real drum set. Even better, it has its own power supply to save you money on batteries and a set of its own drumsticks. A record function helps you revisit your jams, while a USB connection allows you to upload your tracks to your computer or connect your phone to transport music. MP3 and headphone jacks provide even further versatility, including the option to play silently to everyone but you. If you love to jam out as a hobby or know a young person just starting out on the drums, RockJam is a great choice! 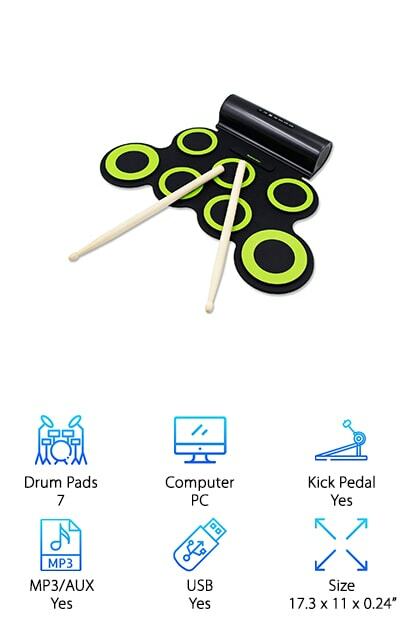 This tabletop drum kit brings you all of your favorite traditional drum sounds through seven pads with ultra-touch sensitivity. It’s like a miniature version of a real set, but compact and portable, so you can take it with you anywhere you go! An AC power adapter lets you go wireless, so you can move around with ease, instead of being plugged into a wall. With 25 built-in preset kits and 215 different percussion choices, you can play to an established beat or create your own.Two foot pedals simulate the sound and feel of a hi-hat and kick drum. Built-in speakers give you the option to play for your fans, while a headphone jack offers you privacy. A detailed LED control panel at the top of the kit lets you record yourself playing and a USB connection allows you to transfer your sounds onto the computer for editing. The Pyle-Pro is a good electronic drum set that delivers everything you’re looking for in a convenient, mobile kit. When you’re in the market for the best electronic drum set for the money, you can’t go wrong with Yamaha. Yamaha is a trusted name in the world of music and its electronic drum set delivers on the brand’s great reputation. Its genuine and durable steel-rack stand display gives the feel of a traditional drum set, but complete with all the benefits of modern electronic technology. A detailed panel offers a mute button, controls for the tempo and volume, and 10 customizable kits. With 297 versatile sounds and built-in lessons, this model has all the bells and whistles for a learner or long-time enthusiast. And get this: it comes with a free iOs app for importing songs and lessons and customizing beats. 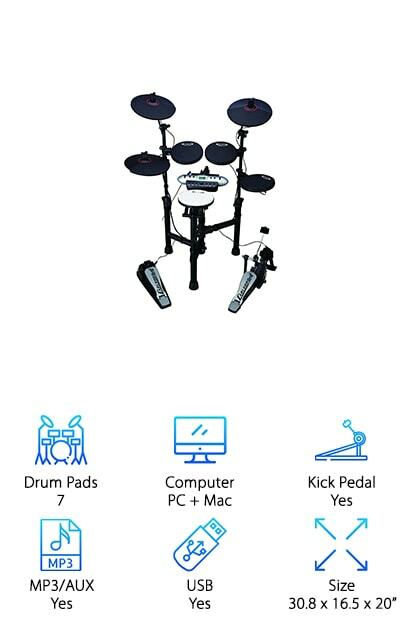 Jam to the music with its four versatile drum pads, three cymbals, and silent-kick pedal. Designed with ultra-quiet pads, you can be sure you’re not disturbing the neighbors. Or you can pump up the volume and rock out! The Paxcess drum kit rolls up for easy, light transport, making it the perfect design for kids on the go or adults who love to show off their skills. This professional kit features seven drum pads, including a crash, tom1, ride, hi-hat, snare, tom2, and tom3. When it comes to an ideal affordable electronic drum set, Paxcess delivers all the bells and whistles and won’t break the bank. A headphone jack allows you to practice in privacy or play for your own pleasure. Built-in dual speakers with powerful bass effects give you the option to pump up the volume to entertain on-lookers. A rechargeable, portable battery provides ten hours of playtime. And here’s the kicker: this awesome model comes with a “special” button that allows the drummer to change the positions of the hi-hat and snare drums to fit their playing style comfortably. Equipped with its own pedals and drumsticks, you don’t want to overlook the Paxcess. 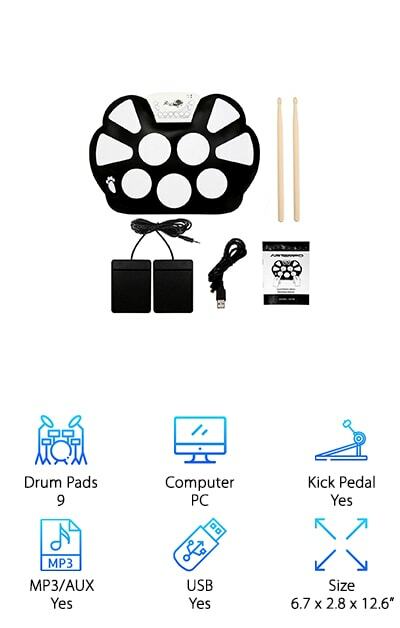 The Spectrum drum kit has all the features of a professional set and comes with its own portable stand and drumsticks, making it our pick for the best electronic drum set for kids. The heavy-duty, double-braced and non-skid design make it a super safe option, so you can rock out as crazy as you like, without the fear of toppling over! Seven ultra-sensitive drum pads and 215 voices can be used to play twenty preset kits, 100 preset songs, or customized into your own beats. And get this: this set comes with bonus downloadable jam tracks and an instructional video download. Perfect for beginners, it features an input and output line and a USB port for connecting to your computer. We combed through all the options to find the best electronic drum set review choices, and Spectrum rounds out our list as one of our favorites. We think it will be one of yours, too! We said we’d bring you the top electronic drum kits, so we’d be remiss not to mention Roland. This deluxe set gives off dynamo sound with ease and is fun to play. Its sturdy, stand-alone design provides drummers the feeling of playing on a traditional, authentic drum set. A special sensing technology makes for a natural experience, so it’s a great option for hobbyists and learners who desire to rock like their favorite bands. Loaded with professionally recorded back songs, Roland is an excellent choice for anyone seeking a play-along learning experience. Even better, it provides a unique COACH option that helps players of all drumming levels hone their skills. A USB port allows you to connect this superior drum kit to your computer to transmit audio and MIDI data and a headphone jack gives you privacy as needed. Roland makes our list as one of our favorite best electronic drum sets for beginners, thanks to all of its convenient features. 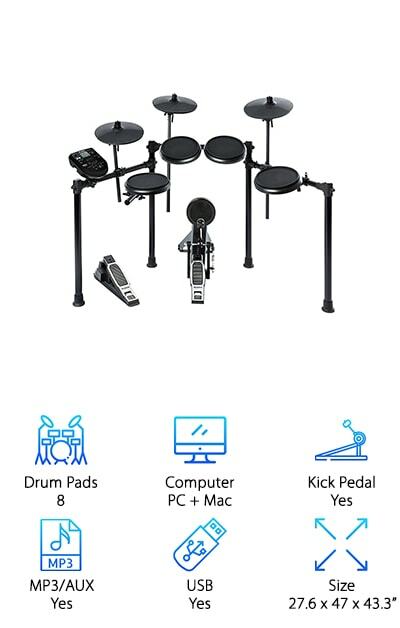 You want the best electronic drum set, so we included the Behringer as a top-quality, professional drum kit perfect for amateurs and enthusiasts alike. This eight piece set comes complete with a kick pedal with trigger pad, dual-zone snare for standard head and rim play, three single-zone pads, three cymbals, and a hi-hat control pedal. As a standing mounted rack, it gives all the feels of a traditional set and the sound it delivers matches. Play along or customize your own kit with the 123 sounds and 15 sets. Enjoy ten presets and five programmable sets. A USB port lets you connect to other electronic devices, including your computer, so you can record and edit your beats. The Aux input allows you to hook up to your iPod, iPad, iPhone, or MP3 player for additional playing options. Plug in your headphones for quiet practice. This awesome drum kit comes with a three-year warranty, so you can feel confident and covered, while you play your heart out. The Carlsbro was specifically designed by engineers to provide all the authentic acoustic sounds of a traditional drum kit, making it a top electronic drum set. This gorgeous, stylish model stands as a mounted rack for a natural experience. Its ultra-compact design makes it easily portable. Even better, it’s equipped with invisible cabling. 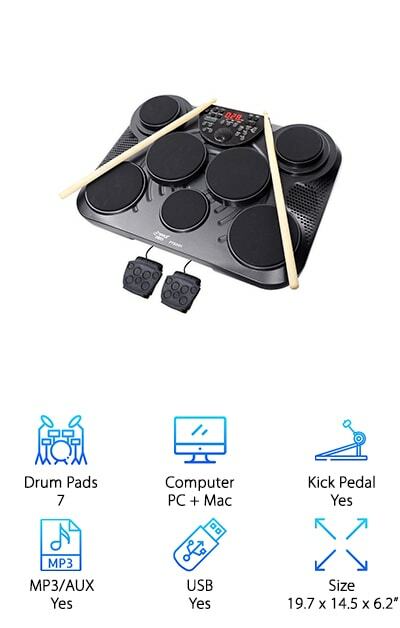 It features a 150 sound module, a bass pad with bass kick pedal, a dual-zone snare pad, three tom pads, a hi-hat cymbal pad, a crash cymbal pad with choke, a ride cymbal pad with choke, and a hi-hat controller pedal. Twenty preset drum kits and 250 high-quality percussion voices give drummers playing options. Customize your own beats or play-along to one of the twenty preset drum kits. Carlsbro sacrifices nothing when it comes to modern benefits. It features an Aux in, a line out, a USB port, and recording and playback ability. The display panel allows for adjustable sensitivity and crosstalk, so you can tailor your experience. If you’re looking for a professional kit, you found it. The Artempo is a super sleek roll-up drum kit that allows you to break out your skills anywhere you go. Its compact, silicone design makes it light and portable and battery power keeps you mobile. Two AAA batteries are all that’s needed to get this kit rocking! Jacks for audio output and input and a USB port help Artempo connect to different devices, including your smartphone. Hook up to your computer or MP3s to record and replay your tracks or add beats to play along with. The sensitive pads and two digital bass and hi-hat foot pedals deliver realistic, traditional sound, so you’ll feel like you’re jamming out on a real drum set. This model’s nine pads include two crash cymbals, a high tom, low tom, ride cymbal, floor tom, bass drum, snare drum, and hi-hat. If you’re seeking the best portable electronic drum set, you don’t want to miss out on the convenience of the Artempo design.